Moscow Diaries: Where have the hooligans gone? In this 3-part series, Ajay Kamalakaran takes in the sights, sounds and rhythm of life in the Russian capital. A few summers ago, as I jogged in Moscow’s city centre on a warm morning, a young man with a beer bottle in hand mockingly jogged with me and asked me if that was the best I could do. There were comparisons to my pace and that of his grandfather’s. As I was inclined to in similar situations, I just smiled and ignored the poor soul. I was in no mood for a brawl at 7 in the morning. These kinds of encounters did make life in Russia a bit more exciting, but I came to understand recently that they are increasingly rare. In late-May, 2012, one former characteristic feature of this great city seems have to become extinct or at least endangered: The Hooligan. On the Tverskaya Street, one of the main thoroughfares in the city centre to the Red Square, people welcome the warmer weather and longer days by roaming about till the early hours of the morning. Young people seem to be out to socialize and not to get drunk and violent. When I asked a friend about the hooligans who were an integral part of life in this metropolis, he asked me to go to some of the distant suburbs but insisted that the aggressiveness and violence has come down. I may have enjoyed some adrenaline from these incidents but I was not going all the way to the suburb of Khimki to look for trouble. Another friend told me that the strong police presence is a major reason that the city centre of Moscow is absolutely safe, even at odd hours. According to this Muscovite, the police have been warned from the top “to lay off foreigners,” especially tourists. Law enforcement personnel are now more concerned with maintaining law and order instead of picking on weary travelers. When I insisted on registration papers at my hotel’s reception, I was told that I was just being paranoid about being stopped on the streets. Sure, the police in Moscow aren’t going to help old ladies cross the streets like the Bobbies in London, but they seem a whole lot less menacing than in years’ past. As I was to find out, you can even manage to get a smile out of some of them. Moscow is indeed a lot more peaceful than in the past but it would be foolish to think that the city is as calm as Singapore. There are occasions when right wing political parties mobilize people to hit the streets and stir up trouble and there is also a loose coalition of ultra-orthodox Christians and skinheads (where else could such an unlikely pair of groups ever be connected?) who go on witch-hunts to attack homosexuals. Then there are the dreaded Spartak Moscow fans. Many Muscovites avoid the metro at or around the time Moscow’s most famous football club is playing. A few years ago, I was told by friends to take off a football jersey while waiting for a train, as we heard the loud singing of Spartak fans, converging on the very station. It was safer to be a shirtless non-Russian man than to wear that jersey - a sign of intimidation to those wild fans! 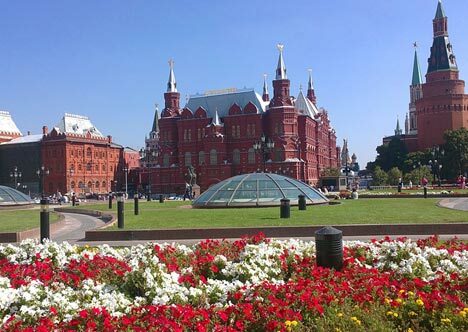 Tourists and businessmen would be relieved to know that Moscow is overall a safe city that is eager to welcome visitors, despite popular perceptions to the contrary overseas. The Western press and the internet are full of horror stories about the streets of the capital and the travel guidebooks don’t spare Moscow either. The ground realities, though, are completely different. Of course, the odd incident can happen to anyone in just about any big city in the world. On an early morning ride on the Moscow metro this week, I bumped into one relic from yesteryear. A man presumably in his forties enters the wagon in a drunken state and starts wildly swinging his hands at no particular object and in no particular direction. This was enough to prompt me to move away, but another man watched the spectacle with almost no amusement. The drunkard was probably a hooligan from years past; one of the few still on the prowl in Moscow. He was harmless but I am sure that any sign of wildness or theatrics on the platform or anywhere else in the metro station would have earned him a free trip to the police station. Such things are no longer commonplace in the capital these days. Moscow has indeed changed and Thank Heavens for that!